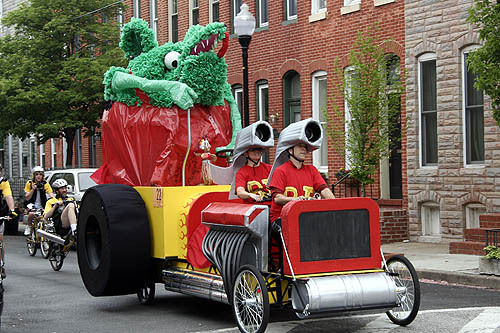 The tenth running of the East Coast Kinetic Sculpture Race Championship in Baltimore was a dramatic spectacle! Forecasts of rainy weather cleared, giving us a delightful day. Only one of the twenty-eight teams even semi-capsized on the Harbor, but the sculptures were fantastic! Some of the water entries were among the best ever! The most dramatic kinetic advance was a live jazz band of Kinetinauts playing as they piloted their sculpture through the course. Thanks to our team of four photographers and seven cameras, we are proud to present better coverage than ever before. Some of the photos are awesome, if we do say so ourselves. 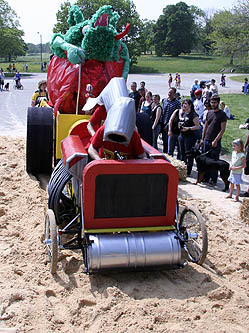 This race was the first since the death of the founder of Kinetic Sculpture Racing, Hobart Brown. 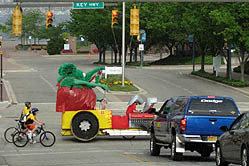 Much of the race—including part of the opening ceremonies and one entire sculpture—was dedicated to Hobart’s memory. 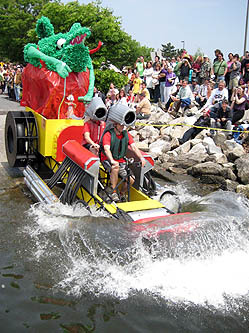 But thanks to his unique indefatigable spirit, Kinetic Sculpture Races all over the world serve as his fantastic legacy. To see others’ coverage of the race, be sure to check out the Links page. 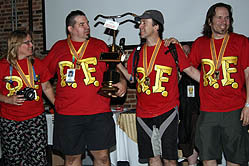 The tenth winner of the annual Grand Mediocre East Coast Championship was Rat Rod. 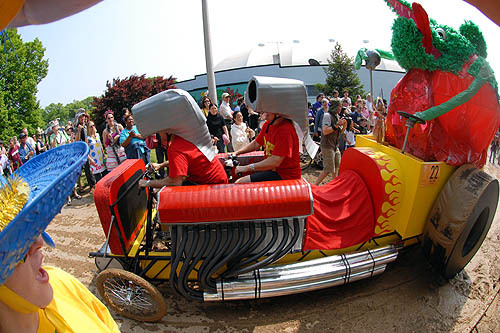 A mechanical embodiment of the Rat Fink character by the late Ed "Big Daddy" Roth, it sported 3-wheel drive, 4 pilots (two visible and two hidden), and 5 wheels. It’s from the folks who created Goes to Eleven in 2007. You can see the deployable exhaust pontoons—compare the location of the chrome pipes on the top photo and at the water entry. The large rear “tires” turned into paddlewheels with supplemental inner tube flotation when the covers were removed. Pilots are Glenn Lehman, Mike Cullen, Mike Phillips, and Sue Harris Phillips, who received considerable support from Jim McGuire.